ORLANDO, Fla. -- Greg Norman has always had a love affair with links golf. An alligator savors the sun near a green on ChampionsGate's International Course. ChampionsGate Golf Resort, an un-matched golf facility for world-class golf, offers 36 holes designed by International golf champion Greg Norman and is the World Headquarters of David Leadbetter Golf Academy. Located just 15 minutes from Walt Disney World and Universal Studios Champions has two excellent and very different golf courses on a single site. Norman grew up playing links, digging balls out of the windswept soil of Australia's Sandbelt region near Melbourne, and he won his only two major titles at the 1986 and 1993 Open Championships. So when he began surveying the treeless landscape and moving dirt to create the International Course at ChampionsGate Golf Club in 2000, it became evident that the site was ideal for an inland links. 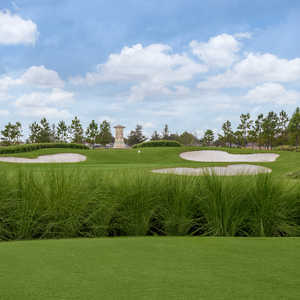 Norman's crew molded large grassy dunes and gouged out more than 160 deep pot bunkers to create a playing experience unique to central Florida. ChampionsGate keeps the course firm and fast to replicate the conditions found overseas in the British Isles. The water hazards sprinkled throughout the course are the only features that don't match with the links theme, but they also make the course more strategic -- and tough. Measuring a lengthy 7,363 yards from the tips, the International boasts one of the highest course ratings (76.8) in Florida with an equally hefty slope of 143. "We always get positive feedback about the International. 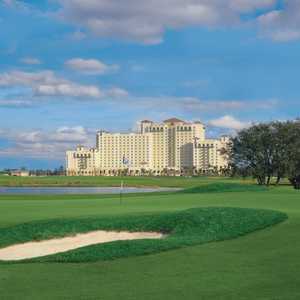 It is a very challenging golf course," ChampionsGate General Manager Alan Findlay said. "Players' scores tend to be five to 10 shots more than their home course." It's tough enough to test major champions. From 2003-08, the course hosted the Office Depot Father-Son Challenge, an event that pitted major champions and their sons in a two-man, team-scramble format. Norman, Jack Nicklaus, Arnold Palmer, Vijay Singh, Bernhard Langer and Larry Nelson all made appearances. Michelle Wie is the big name who owns the course record with a 65. Wie set the mark while visiting the on-site David Leadbetter Golf Academy to work with her world-famous teacher. Champions Tour players Brad Bryant, Denis Watson and Mark McNulty have been known to stop by. The layout never relinquishes an easy par. The 576-yard third hole requires a driver over a diagonal water hazard that finds the fairway between five pot bunkers. Five more bunkers guard the green. Be sure to pay close attention to the GPS in the cart at the par-4 15th hole to avoid the two pot bunkers in the middle of the fairway. The par 3s on the golf course stand out. From the generous white tees of 6,239 yards, players must pull four different clubs to hit shots of 158, 182, 208 and 118 yards. Findlay has an affinity for the shortest one on the course, the 17th. "It is quite a shallow to hit, akin to the Golden Bell (hole) at Augusta National," he said. "Distance isn't a problem, but accuracy is. The 17th can provide birdie or bogey or worse." The 572-yard 18th hole provided quite a memory for the Singh family. Vijay's son, Qass, busted a 3-wood to tap-in range in the 2004 tournament when his father was No. 1 in the world. Coupled with the wonderful four-diamond Omni Orlando Resort at ChampionsGate next door -- home to 720 rooms and suites, two- and three-bedroom villas, a European-themed spa, five restaurants, a child-friendly par 3 and 15 acres of pools, including a lazy river -- ChampionsGate is a versatile destination catering to golfers, families and corporate travelers. Within a half-hour's drive are the Orlando International Airport, Walt Disney World, Universal Studios and SeaWorld.